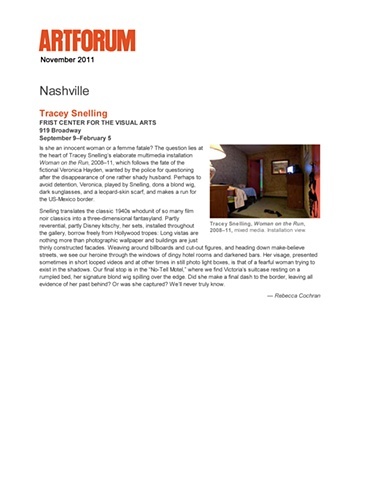 Tracey Snelling - Artforum review of "Woman on the Run"
Artforum review of "Woman on the Run"
Is she an innocent woman or a femme fatale? The question lies at the heart of Tracey Snellings elaborate multimedia installation Woman on the Run, 200811, which follows the fate of the fictional Veronica Hayden, wanted by the police for questioning after the disappearance of one rather shady husband. Perhaps to avoid detention, Veronica, played by Snelling, dons a blond wig, dark sunglasses, and a leopard-skin scarf, and makes a run for the US-Mexico border. Snelling translates the classic 1940s whodunit of so many film noir classics into a three-dimensional fantasyland. Partly reverential, partly Disney kitschy, her sets, installed throughout the gallery, borrow freely from Hollywood tropes: Long vistas are nothing more than photographic wallpaper and buildings are just thinly constructed facades. Weaving around billboards and cut-out figures, and heading down make-believe streets, we see our heroine through the windows of dingy hotel rooms and darkened bars. Her visage, presented sometimes in short looped videos and at other times in still photo light boxes, is that of a fearful woman trying to exist in the shadows. Our final stop is in the No-Tell Motel, where we find Victorias suitcase resting on a rumpled bed, her signature blond wig spilling over the edge. Did she make a final dash to the border, leaving all evidence of her past behind? Or was she captured? Well never truly know.